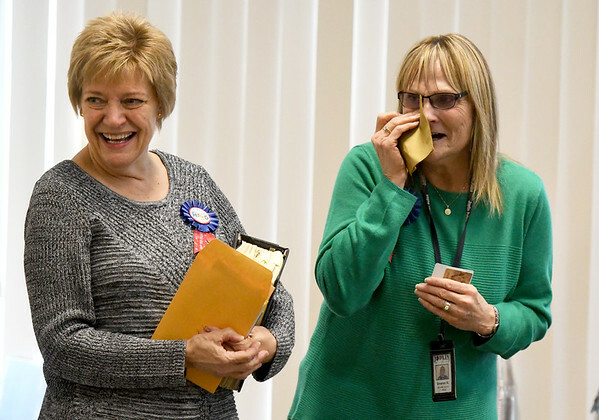 From the left: Longtime City of Joplin employees Linda Foulks, accounting specialist for the Finance Department, and Sharon Shackelford, IT analyst with the Information Technology Department, are recognized during a special retirement ceremony on Wednesday at City Hall. Foulks is the longest active employee with the city. She served the city for 47 years, nine months and is said to have called in sick just once during that time. Shackelford retires after 32 years and three months with the City of Joplin, where she began as a founding employee of her department.